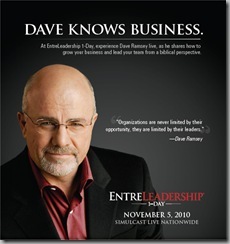 This past November I had the opportunity to attend a one day simulcast of Dave Ramsey’s Entre-Leadership. It was inspiring and motivating, and I brought back a number of concepts to share with my team at Cash4Books and MKZbooks. It occurred to me that this is great material to also share on The Green Frugal, as there are a number of tips on credit, debt, savings, purchasing, and more. Avoid risk when making large purchases. Buy USED whenever possible. Do you really need a brand NEW car? A brand new refrigerator? Washer/dryer? Couch? Use craigslist.org to find some great buys on used items. Or, check your local thrift store. I was just at the Hillsboro Salvation Army with my brother-in-law Jordan, and they had a special going with 50% off everything in the store! He got a great deal on a couch. Try the Debt Snowball technique. Many Americans are in debt… some of us severely in debt. How do we get out of debt? One technique is to take an inventory of every debt you have. List them out on a piece of paper in order of the lowest balance owed to the highest balance owed. Next make the MINIMUM payment on EVERY debt EXCEPT the one on the top of the list. For the debt on the top of your list, pay the most that you can reasonably afford. After you pay off the first one on your list, take your pen and cross it off. Then attack the next one on your list. Crossing them off will give you quick “wins” and motivation to keep going until they are all paid off. The money you gradually save on not having to make all the debt payments is snowballed into more money to attack the debt at the top of your list. Pay CASH. Cut up those credit cards! Or, you could freeze them in a giant block of ice so that you always have a “cooling off period” if you struggle with impulse purchasing. Debit cards are too easy to use–so, don’t use them. My wife, Breanne, and I have found that it works best for us to budget with cash. She takes cash out of the bank every week and uses it for groceries and other regular expenses such as gas for the car. Many of our bills are paid through online bill pay, so there is no need to budget cash for those. We rarely use a debit card and we no longer have personal credit cards (we haven’t for years). If you would like to see my PDF presentation of Dave Ramsey Entre-Leadership highlights and ah-ha moments, I’ve made it available as a link below. I showed this presentation to my Cash4Books and MKZbooks team members! This entry was posted in Cash4Books News & Updates, Saving Money and tagged budget, Save money, saving money, thrifty, tips on December 30, 2010 by Jim McKenzie Smith.